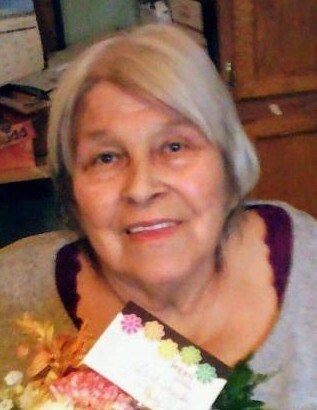 Lottie Louise (Muma) McCaslin, 74, of Kaleva, passed away at her home on January 22, 2019. Lottie was born on November 28, 1944, in Coldsprings Township, Kalkaska County, the daughter of Donald C. Muma and Josephine (DeVerney) Muma. Lottie was a very giving person. She enjoyed playing cards, bowling and loved to go fishing, mushroom picking, and enjoyed sewing. Most of all she loved spending time with her family. She is survived by her husband, Gene McCaslin; seven children, Robert (Nancy) McCaslin of Bath, New York, Cheryl Windish of Kaleva, Shirley Crane of Charlevoix, David (Tracey) Crane of Mancelona, Sandra McCaslin of Kaleva, Tresa McCaslin of Wellston, and Rubee McCaslin of Ludington; and seven siblings, Gertrude Beihling of East Jordan, Jesse Muma of Mancelona, Steven (Sharon) Muma of Monroe, Nina (Don) Hawver of Mancelona, Gayla (John III) Grocholski of Mancelona, Patrick (Judy) Muma of East Jordan, and Doug Muma of Gladstone, along with many grandchildren and great grandchildren. She was preceded in death by her parents; and seven siblings, Diane Bard, Wilfrieda Somerville, Rodney Muma, William (Billy) Muma, Arlene (Vicki) Moore, Donald C. (Sonny) Muma, and Alfred Muma. Funeral services will be held on Friday, January 25, 2019 at 2:00 p.m. at the Mancelona Chapel of Mortensen Funeral Homes with Pastor Brent Bontrager officiating. Visitation will be from 1:00 p.m. until the beginning of the service. Burial will take place in the spring of 2019, in Coldsprings Township Cemetery, when weather permits. Memorial contributions can be made to her husband, Gene McCaslin. Arrangements have been handled by the Mancelona Chapel of Mortensen Funeral Homes. Please visit her online guestbook www.mortensenfuneralhomes.com.